This emphasis on complexity and humanity of character continued in his response to a question about the roles he chooses and the “good guy/bad guy” dynamic. “No such thing,” he declared. He is most interested in the fundamental humanity of his characters. It’s important to remember that whether talking about Lucius Malfoy, Col. William Tavington, Captain Hook, or Captain Lorca, Isaacs feels his characters think they see the world in the right way. Of Malfoy, Isaacs proclaimed he was out to make Hogwarts great again! Of the Harry Potter series, Isaacs pointed out that it is both timeless and incredibly contemporary. As he reflected upon the complex humanity of his characters he turned his attention first to Lucius Malfoy. Malfoy, racist and fearful, was “desperate” to be on the winning side. Voldemort, Isaacs declared, “can smell it.” Of Col. William Tavington of The Patriot, Isaacs pointed out that, as the second son of an aristocrat, he would inherit nothing from his father (primogeniture). For these second sons, carving out lands, titles, and wealth in the colonies was the primary avenue to their future. Tavington is desperate to protect his interests and future. To do so, he had to dehumanize the enemy. Isaacs turned to a broader discussion of acting when asked if he knew of Lorca’s secret. Isaacs “had to know Lorca’s secret” in order to understand and play the character. He sees acting as making up the 99.9% of stuff that makes us human and that never gets spoken. Moreover, it is an act of being childlike and embracing imagination. A master of dialect, he has used language to help him “disappear” into the crowd. Isaacs pointed out that in England accent reveals not just point of origin but also type and level of education, as well as socio-economic class. He learned early to adapt and to become part of any crowd. His mastery of dialect has served him well over his career. Captain Lorca has a southern accent, as did Steel from Black Hawk Down. Isaacs touched on the importance of improv as an actor. He stressed how important it was to rehearse in theater, but in film, it’s more important to have the camera rolling to catch those first reactions. He also briefly mentioned the use of having to improv when working in front of a green screen. For Harry Potter, the majority of the set was built because it was such a long-running movie series. The scene in the Hall of Prophecy though, was heavily green screened, including the mask the Death Eaters all wore. Isaacs’ engagement with all that is human as an actor was powerfully captured in his discussion of his work in the film Peter Pan. The story, he said, was fundamentally about a child (Wendy) being told it’s time to be a woman. She stands on the cusp of fundamental change and feels horror when considering what the world expects of her (marriage, childbirth, and child rearing). Isaacs had lots of stories to tell about his times on set, emphasizing how much fun the jobs and other actors are. Fans were treated to stories of his time working on The Tuxedo with Jackie Chan, as well as his time on the set of Armageddon. 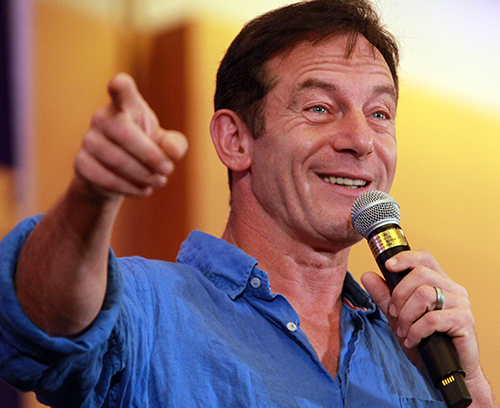 In the final analysis, the world of Jason Isaacs is filled with all that makes us human, both the good and bad, told and retold through story.